It’s getting cold outside and winter is slowly approaching! Your little feathered friends will be feeling it, too! The winter brings the birds a limited supply of water. Birds need water for drinking, bathing and preening. An excellent way to help birds in the winter is to provide the birds with a heated bird bath. This will supply the birds with the liquid water that they need in the cold weather. Heated bird baths are operated by thermostats, similar to your home heating unit, and as the temperature falls to specific levels the unit will turn on and heat the water. The advantage of the thermostat is that the heating element is only used when needed. To eliminate electric all together, a solar bird bath can be used. 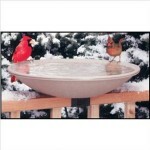 Heated bird baths come in many different styles, colors, sizes and designs. It is easy to choose one that will be well-suited to your special bird feeding area. 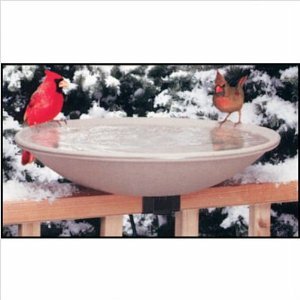 The distinct styles of heated bird baths include deck mounted, ground level, hanging, standing or pedestal models. This provides birders with many different options and placement opportunities. A dark colored heated bird bath works better in the winter. The two advantages of the dark color is that it absorbs more solar radiation so it uses less electricity and it can be seen more easily by the birds in the snow. The size of the heated bird bath will determine the variety of birds that it will attract. A smaller bird bath will limit the number of birds, while a larger bird bath will attract a wider variety of birds. A bird bath will attract different birds that you would not normally see at your bird feeder. Heated bird baths can be purchased in a number of unique designs. Some of the many designs are: bird bath spas, tilt and clean, bird bath fountains, 2-tier solar bird baths, sculpted bird baths, drippers, misters, wigglers and bubblers to name a few. Remember to keep the bird bath clean and keep the rim clear of snow. This winter provide the birds with a heated bird bath and they will provide you with hours of entertainment. For more information on heated bird baths click here. Setting up a bird bath fountain is an easy way to attract birds to your yard. The seeds that your bird feeder contains will only attract certain birds. By adding a bird bath fountain to your backyard you will draw additional species of birds. You will be seeing 2 to 3 times more birds in your yard. Water is essential to birds. They need water to drink and they also love to play in the water. Watching birds at the bird bath fountain will provide you with entertainment as you watch the birds splashing in it. A bird bath fountain, with the sound of moving water, will attract plenty of birds. Still water bird baths can be a breeding ground for mosquitoes. Running water from misters, drippers or waterfalls in the bird bath fountain alleviates that problem. A bird bath fountain can be operated by either electric or solar power. A solar powered bird bath fountain doesn’t require any additional plumbing or electrical wiring. It costs nothing to run, but does require placement in a sunny location. Bird bath fountains are constructed out of many different materials: mosaic tiles, concrete, stone, cement, copper, glass, marble, resin, brass or other metals. The design of a bird bath fountain can be very elaborate and will make a statement in your garden habitat. Conversely, there are bird bath fountains made to blend into the natural landscape. There should be a rim that is easy for birds to grip so that it can act as a perch. The bowl should have a depth of 2-3 inches. If you have a deeper bowl, placing small pebbles in the bottom will decrease the depth. A textured surface will keep the birds from slipping. There are a variety of different types of bird baths: deck mount, hanging, tiered and pedestal. The deck mount is simple to install and is ideal for apartment dwellers or those who don’t have a large yard. The drawback to a deck mount bird bath is that it is easy prey for cats. If there are cats in the area you may want to think twice about selecting this style. The hanging bird bath can be hung from trees, overhangs or awnings. The downside to the hanging bird bath is that the birds can get it to swing and swish the water right out. This may have you filling the bird bath more often than you would like. A waterfall bird bath fountain is tiered. This style allows the birds to take a shower under the falling water. 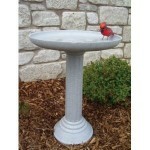 A very popular and versatile choice is the pedestal bird bath fountain. This is a preferred bird bath because it can be placed in any area of your yard. Many of the different types of bird bath fountains incorporate misters and drippers in the bird bath. Hummingbirds and warblers love to fly through the misters. Look for an open spot to locate your bird bath fountain. You want the birds to feel safe so make sure that cats don’t have easy access to the area. In hot weather you should clean your bird bath fountain daily. In cooler weather it should be cleaned every few days. Remember, that a bird bath heater should be installed to keep the water from freezing in the winter. With proper maintenance your bird bath fountain will last for many years. The perfect bird bath fountain, as recommended by birding enthusiasts, is one with moving water, functional perches, a textured surface and one that is solar powered. You will appreciate the beauty it brings to your garden bird feeder habitat. The birds will love your bird bath fountain. Just sit back and enjoy the view!